Nalda Searles has been one of the major influences in my artistic life, specifically her interest in using what is to hand and encouraging you to spend more time on actually creating work than on going and buying the ‘perfect’ material. I first met Nalda when she stood in for Ruth Hadlow in a class at Geelong Textile Fibre Forum in the early 2000’s. 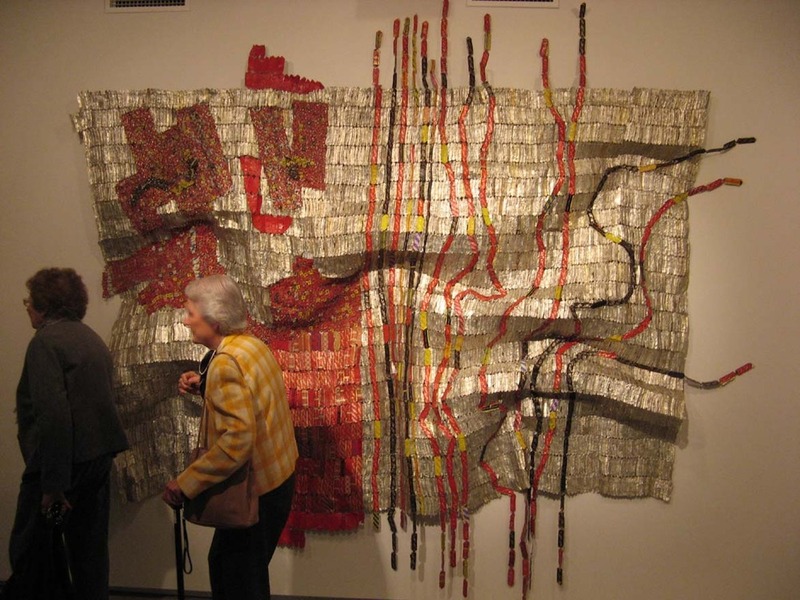 Her exhibition Drifting in My Own Land has been on show at the ANU School of Art Gallery for the past few weeks. I managed to get just one view of it on my return from Newcastle. I did two drawings on the day and I’m now kicking myself for not just putting more money in the parking meter and going back to do more. 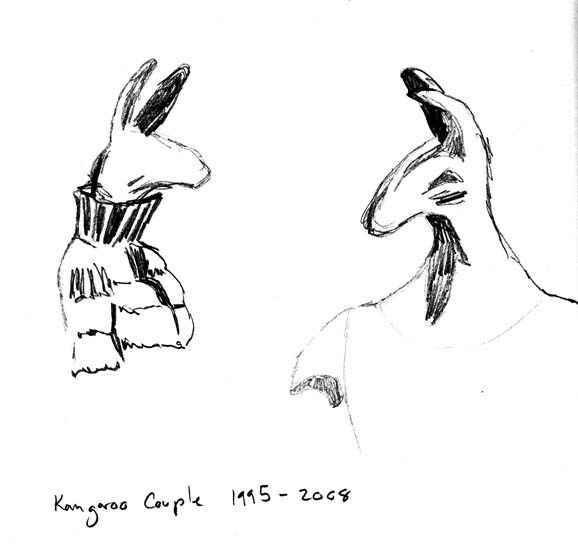 Blind drawing of Kangaroo Couple, 1995-2008 (the piece has undergone several transformations to reach it’s current state). Focus on the two heads of the kangaroos made with fodder grass. The exhibition was essential Nalda. Sculptural objects and textiles made from disparate materials that are just so ‘right’ when they are brought together. 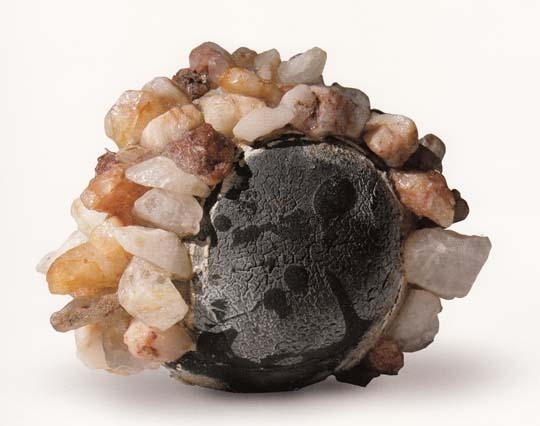 Here is her work Tjunti, 1996, made with a perished tennis ball and quartz stones picked up in the bed of the Tjunti river. I only had one day in Sydney, but when I looked at the program for the Sydney Biennale I knew I had to include a flying visit to the Museum of Contemporary Art, which was one of the Biennale venues. 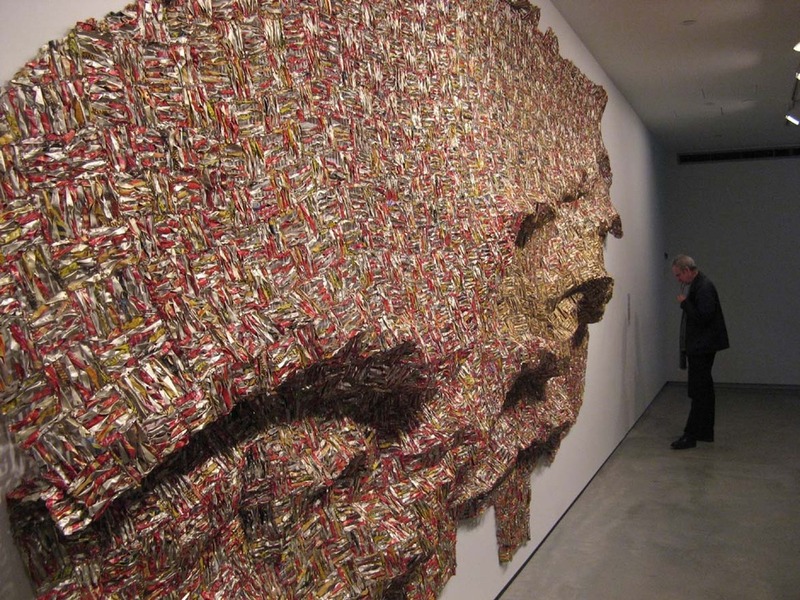 I had to see in person the work of El Anatsui a Ghanaian born artist who lives and works in Nigeria. 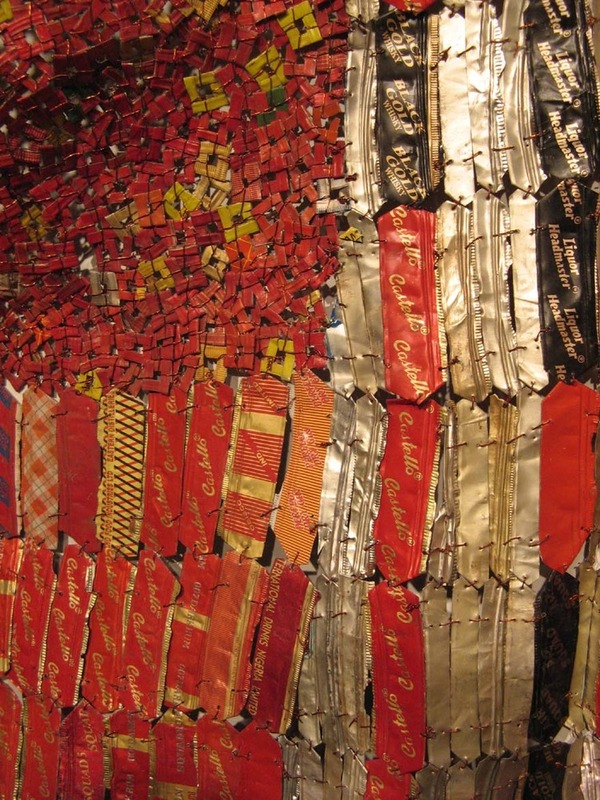 I’ve long wanted to see these monumental works that look like textiles but are made of small scraps of metal wired together in large ‘patchwork’ forms. Afor 2010, aluminium liquor bottle caps and copper wire. A detail of Afor showing the wiring together of the flattened bottle caps. While in Newcastle for the Fetish exhibition I took the opportunity to take a quick trip to Sydney to see the Kamisaka Sekka exhibition, Dawn of Modern Japanese Design, at the Art Gallery of NSW. I’m glad I made the visit to see the exquisite work of this designer. The show is displayed over two floors and is drawn largely from works from the Hosomi Museum in Kyoto.The introduction to the exhibition shows works from a number of artists of the Rinpa School who influenced Sekka’s work. This plate with decoration by Ogata Kenzan of Chinese bellflowers (1712-1731) is a particular favourite. I also like the working drawing showing various versions of this plate design by Sekka 1920-30, Kiyomizu Rokubai V, made the plate. Cigarette case 1920’s, design by Sekka and lacquer by Kamisaka Yukichi. These pawlonia wood trays with designs of pine trees were high on the list of ‘if I could have one thing from this exhibition…’. Design by Sekka 1920-25. A woodblock print from the series A World of Things, 1909-10. The original watercolour for this particular print, Plum Blossoms Beside the Eaves, was on display and was thoroughly engaging. 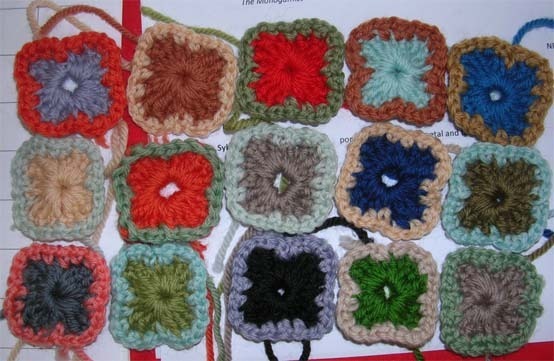 My response, rather brighter, was to make ‘hydrangeas’ in crochet. Not sure how I will use them as yet. I’m using up left over tapestry wool that I found in a Newcastle op-shop. Closer to Sekka’s painting style are a series of paintings using Japanese pigments I’ve had sitting around my workroom for several years. Time they got used. Wow the show is up and all the work looks fantastic, thanks to the massive coordinating prowess of curator Eleanor Jane Robinson and hanging help from Clare Weeks (whose beautiful photograph, Noisy Minor appears on the exhibition invitation, see previous post). Podspace was absolutely jam-packed on opening night and Jen and the other Octapod staff gave us great help in setting up and managing the food and drink. The opening in full swing! Seen here in the gallery window are Gazes 1&2 and 3&4, by Eleanor Jane Robinson. These amazing works are all stitched with black thread (no not drawn) and just to add to the degree of difficulty all the stitches are all made vertically. Here is another of Robinson’s works from The Glimpses series. Daniel Smith’s work is both quirky and amazingly detailed. The top image is Tension and the one below is Beauty Therapy? His series of small diorama’s are made with scale model figures and quite a bit of imagination. 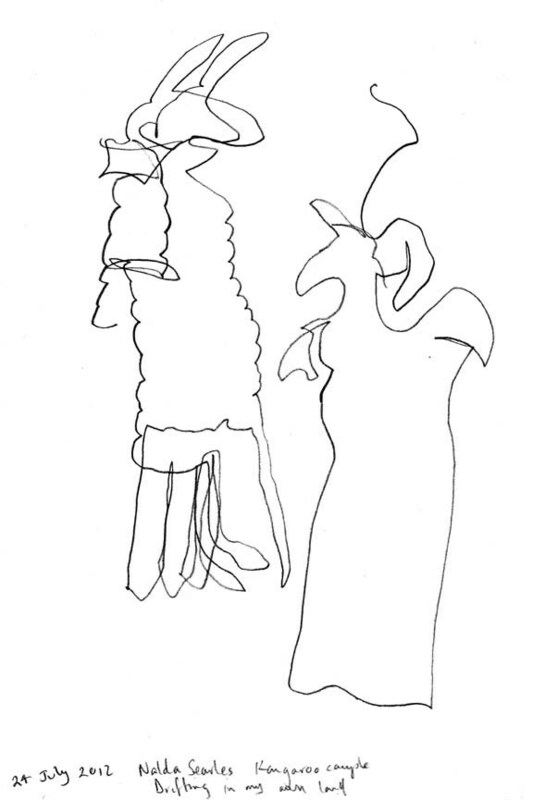 More of Daniel’s work can be seen on his site. Ray’s found object and porcelain Tongue Tired (above) also received a great response and was one of the most commented upon works on the night. Here is my contribution, The Odd Couple 2, Calling and Washed Up (from left to right). 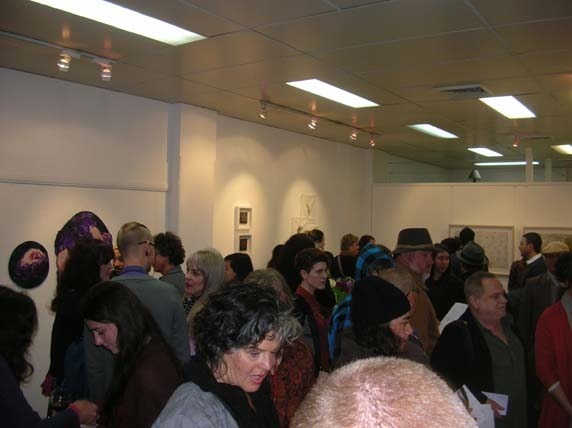 My apologies for not having good images to show of the work of other artists in the show. 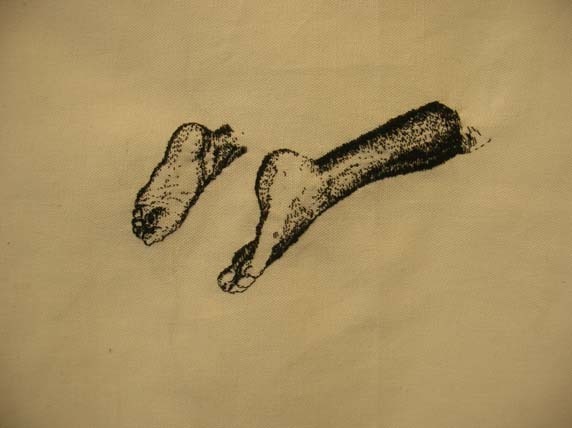 These include Sarah Barron’s Muybridge series, complex images using cyanotype and mixed media processes; Rose Turner’s paintings Fecund Phalanges; Sally Dooner’s Mossy Point series, using images composed of delicate shells and bones and her lantern slides of birds; and Gina McDonald’s print series Love Fetishes in Brancusi’s Studio. It was really good to see that there were plenty of sales across the exhibition on opening night. Music to an artist’s ears! Three shows in a row! which goes some way to explaining why not much is happening on the blog. Far too busy stitching. Anyway if you are in Newcastle over the next 3 weeks you can see my work, along with that of 8 other artists at Podspace, 401 Hunter St Newcastle from 18 July to 4 August. Opening night is 19 July 6.00 to 8.00pm. Hope you can make it.